We are finishing off the 2018/19 Outdoor Drive-In Movie with two MASSIVE movies. Both were so popular that we are putting them on again as we know people missed out on tickets last time. 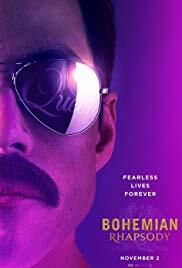 Load up the car on Saturday the 11th of May, and come along to watch Bohemian Rhapsody at the Outdoor Drive-In Movies, its an awesome movie, so why not enjoy it in the comfort of your own car?! Minimum ticket pre-sales are required for this event to go ahead. If you are intending on watching the movie from the boot of your vehicle, we need to make sure that your boot doesn’t open past the continuation of your vehicles roof line and potentially block the view of vehicles behind you.